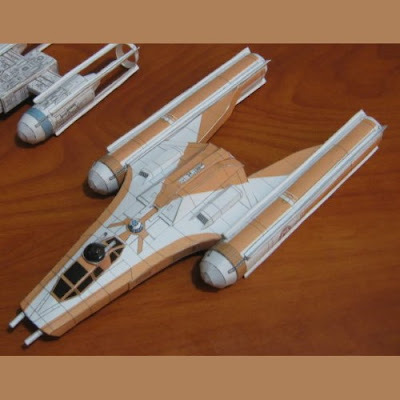 In the Star Wars universe, the BTL-B Y-wing assault starfighter first saw use during the Clone Wars. Later the BTL-B was modified into two different models, the BTL-S3 and the BTL-A4. The BTL-S3 supports a two man crew while the BTL-A4 is a one-man version of the craft. Both starfighters were used by the Rebel Alliance in their struggles against the Galactic Empire. This paper model BTL-B was created by James Gemperline. A PDF file of the template for the model may be downloaded here. 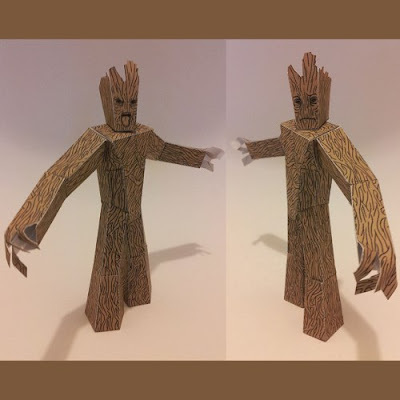 Finally another Groot papercraft! Produced by a graphic designer, this Groot paper toy comes with two different heads. One of the heads has an angry face. The other head has a somewhat sad looking face. The JPG template for the model may be downloaded at Behance. Guardians of the Galaxy Vol 2 is set to be released in theaters on May 5th of this year. Can't wait! 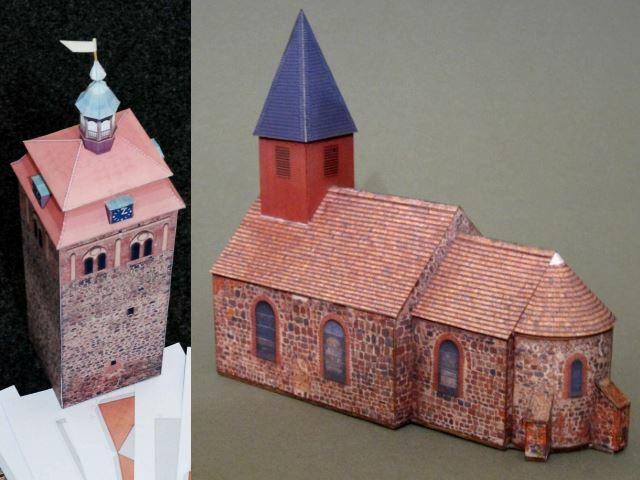 These two free architecture paper models are offered on the website of the Administration of Teltow-Fläming, a district in the state of Brandenburg, Germany. On the left is the market tower of the city of Luckenwalde. On the right is the village church of the city of Mellnsdorf. Both these landmarks were under construction in the first half of the 13th century. The scale of the paper models is 1:87 (HO). High resolution photographs of the actual buildings were used to create the PDF papecraft templates which may be downloaded here. 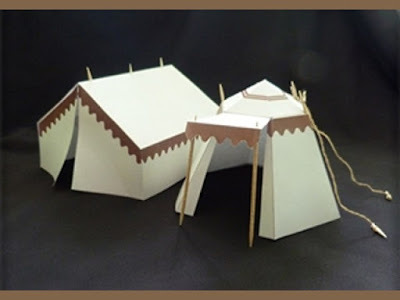 These papercraft tents were designed as a craft project for children to teach them about Priscilla and Aquila, a married couple mentioned in several books in the Christian New Testament. Priscilla and Aquila were tentmakers by trade. 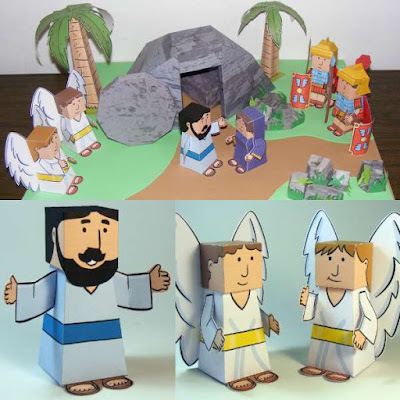 Three different tent models are available for download at the Jesus Without Words website. Not pictured is the "pup" style tent. These might be useful for miniature gaming, although they will probably need to be printed at a different scale if used for that purpose. 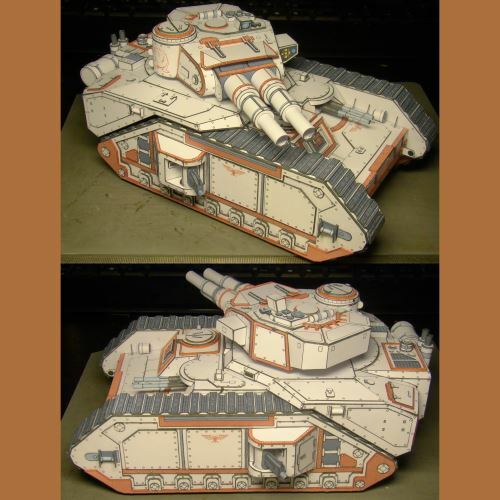 This paper model of a Warhammer 40K Macharius tank is a repaint by of a model originally created by Eli Patoroch. A PDF template for the model may be downloaded here. The Macharius' weapons include: turret-mounted Twin-Linked Battle Cannons, a hull-mounted Twin-Linked Heavy Stubber, and a sponson-mounted Heavy Bolter on each side. Build photos and repaint by tapapercraft. Here's a cute Cupid paper toy to make for a Valentine's Day decoration. Although it looks simple enough to build, the designer of this papercraft sets the difficulty level of the toy at "medium". A printable PDF of the template may be downloaded here. Valentine's day has been celebrated in the United States since the 19th century. 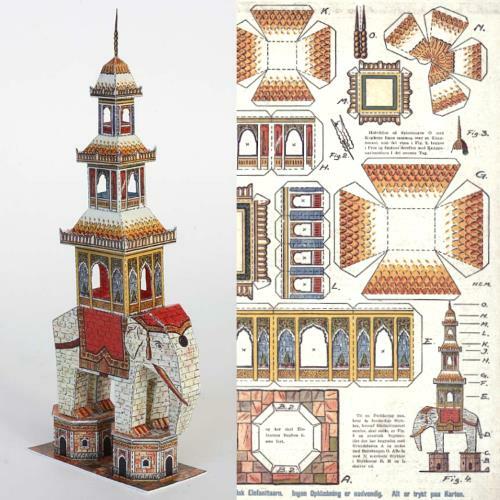 There have been copies of this antique papercraft elephant pagoda floating around the Internet for years. Now thanks to someone at Wurlington Press we finally get to see what the finished model looks like! As far as I can tell from doing a little research, a real-life building like this probably did not exist. There are however numerous bronze statuettes and incense burners that are similar. Some of them are ancient. The template for the elephant pagoda was originally published in 1928 in the Danish magazine, Illustreet Familie-Journal. A scan of the template may be found here.